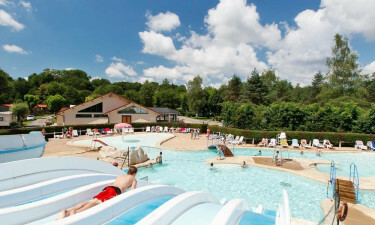 Val de Bonnal is the ideal holiday camping site to disconnect from routine and enjoy nature in one of France's most beautiful regions. This luxury campsite stands out from the rest in terms of its riverside location, the quality and comfort levels of the accommodation on offer, and the flawless service given to each and every guest. Book your next camping holiday in France with Lux-Camp to experience it for yourself. At Val de Bonnal, quality accommodation is an essential aspect of every camping luxury experience. All mobile home units are surrounded by greenery and have been furnished and equipped to very high standards. There are 12 different types of chalets and mobile homes available, which can comfortably accommodate anything from 2 to 6 people. Why choose Val de Bonnal for your next holiday? Below you will be able to read more about the reasons why you should choose to go on holiday to Val de Bonnal. Val de Bonnal's multilingual and enthusiastic staff have put together an exciting entertainment programme that caters to guests of all ages and varies depending on the time of the day. A supervised kids' club runs every morning and is followed by an afternoon programme packed with sports activities. 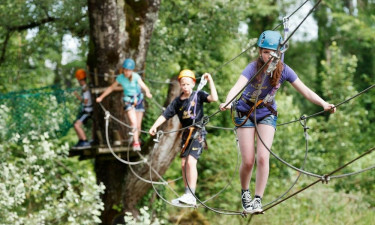 Children and teenagers can also have a go at ziplining or try some arts and crafts activities. Adults can enjoy mountain biking, fishing, or keeping fit at the site's air-conditioned fitness room. Val de Bonnal's on-site water park is one of the highlights of this five-star campsite. The water park complex comes complete with water slides, heated pools, a lakeside beach, and a large splash park, among many other amenities. All in all, the water park more than 370 acres where guests can enjoy canoeing, swimming, kayaking, and more. Nearby activities include golfing and sailing. 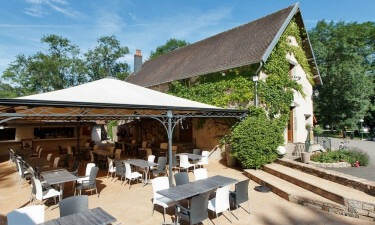 Val de Bonnal offers its guests quality catering services at its ample and welcoming restaurants. The on-site restaurants serve snacks and full meals, and also offer a takeaway option. The campsite's bar and snack bar terrace have a family-friendly environment and are great places to socialise and meet other guests. Val de Bonnal's on-site shop sells everything from groceries to souvenirs and including postcards, fresh fruit and vegetables, newspapers, holiday essentials, and a range of local products like cheeses and cold meats. Freshly baked goods are on sale every day too.